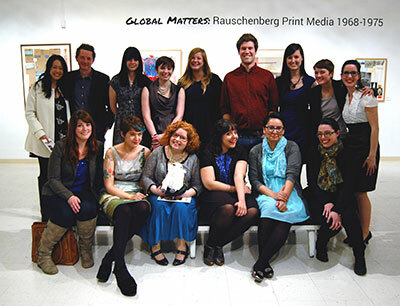 Global Matters: Rauschenberg Print Media 1968-1975 opened in the UWM Art History Gallery on Earth Day, Wednesday, April 22, 2015. Graduate student in Associate Professor Richard Leson’s ARTHIST 704: Introduction to Art Museum Studies designed and curated the exhibition. Students from the Education and Programming group gave a gallery talk during the opening reception. The exhibition used prints from the UWM Art Collection donated by Virginia and Thomas Maher and Emile H. Mathis II. The exhibition, catalogue, and accompanying programs were been made possible, in part, through the generosity of the Robert Rauschenberg Foundation’s Shuffle program, UWM Friends of Art History, UWM Year of the Humanities Committee, UWM Department of History, UWM English Department, and the UWM Center for International Education.